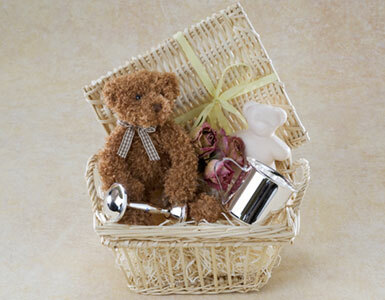 Our small baby basket holds a stuffed puppy dog, a mild, baby-safe soap shaped like a teddy bear and a silver plated baby rattle. The gift will be accented with either blue or pink wired French ribbon. We offer sterling silver baby rattles, baby blanket fleece, sterling silver baby cups, silver baby gifts, infant gift sets, and baby teddy bears, and promptly deliver your infant gift set and other baby gifts to your home or office in Los Angeles, Beverly Hills, West Hollywood and Santa Monica.